Utilizing Social Media as recruiting tool offers many advantages, but if used incorrectly you could be spinning your wheels. We find this article written by Leona Matson of webrecruit to be right on target. There are definitely some challenges to using this method effectively and we believe Leona covers some of the most important topics very well. The Social Media saga continues… The next time a so called ‘Social Media Expert’ attempts to convince you why social media is extremely important, consider this very enlightening study that outlines some interesting facts about consumers. Although social media is very important, as a business owner, you need to truly understand the consumers’ view and what is important to them. Only then will you be able to effectively utilize this marketing tool. The above line is from a recent report put out by Forbes Insights and Turn called “The New Rules of engagement: Measuring the Power of Social Currency” and unfortunately continues a trend – a trend I myself have written about as far back as last December. Last December I wrote of The Major Disconnect Between Brands and Consumers When It Comes to Social Media. About a month later I followed that up with Even More Proof of the Major Disconnect Between Brands and Consumers When It Comes to Social Media. Each article touched on a different survey/study which showed a huge divide between why marketers think a consumer likes/follows a brand on social media vs. why a consumer actually does so. Well according to the aforementioned Forbes Insights study the disconnect is alive and well and may even be widening. 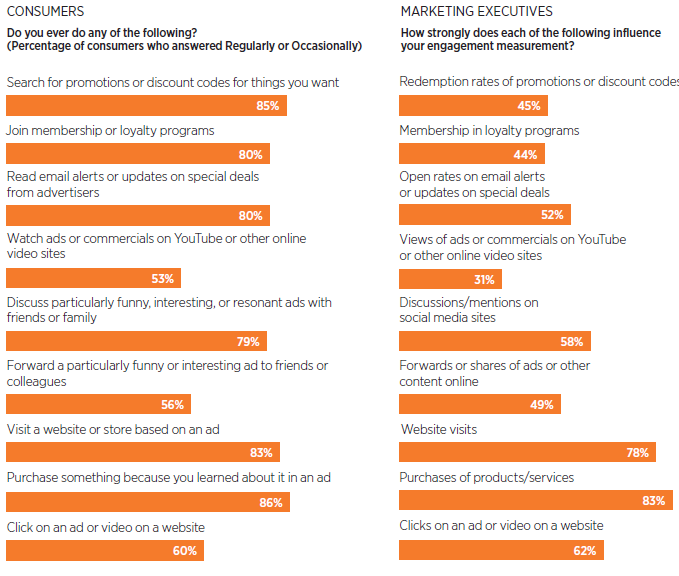 Marketers view consumers’ proactivity via social media as more engaging then consumers do. The inflation of “engagement” in this case has been caused by the ease of social media use and equating online followers with successful marketing. Measurement of social media engagement is an area where CMOs often don’t know what they don’t know. Fundamental disconnects in how marketers and consumers understand and value engagement tactics may cost marketers great opportunities. The biggest schisms are found in approach to redemption rates, discount codes and loyalty programs. Additionally, marketers’ attempts at personalization and customization engage few consumers. This finding may stem from consumers’ high expectations of what true customization and personalization stands for. Consumers identify strongly with brands, particularly younger consumers, who view their relationship with brands as a reflection of self. And they approach and interact with them in a variety of ways, from social media to traditional advertising. They don’t necessarily view this as engagement, however. Rather, their view of how they interact with and relate to brands is much more holistic. 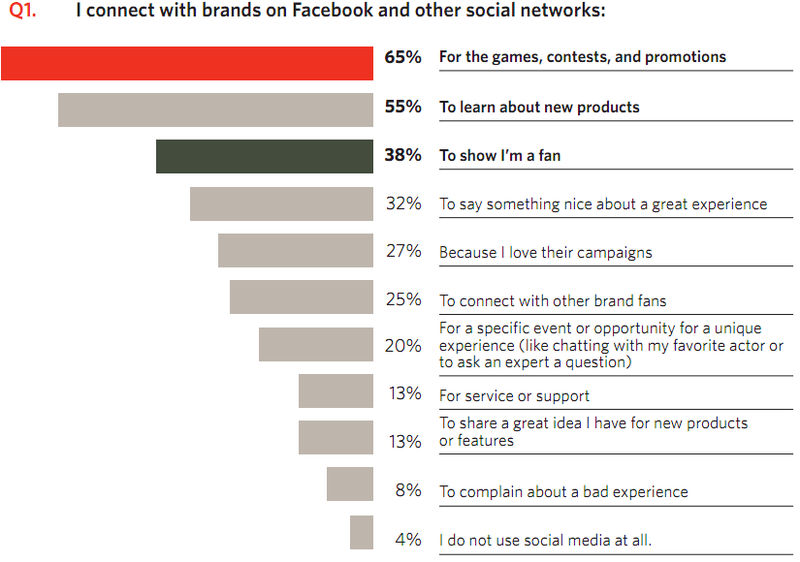 Just take a look at the chart below and spot all the disconnects between what marketers value compared to what consumers value. 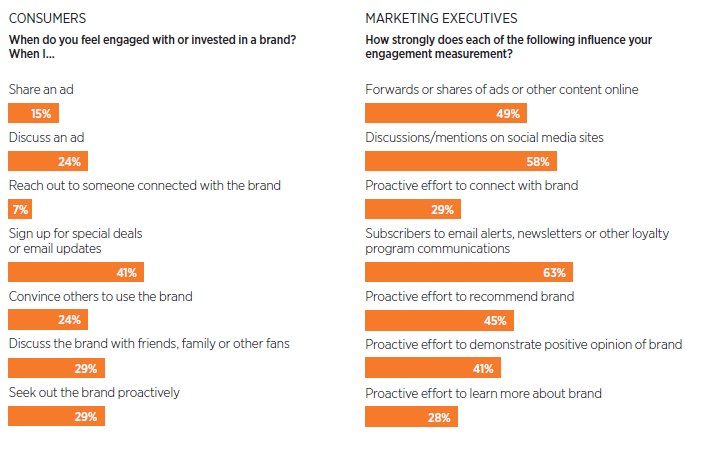 Perhaps the most glaring example of a disconnect from the above chart lies in the fact that 49% of marketers rate forwards or shares of ads or other content online as a strong influence on their engagement measures, but just 15% of consumers say they feel engaged or invested in a brand when they share an ad. So the next time all you marketers out there break into a happy dance because 100 people shared your ad you may want to temper your enthusiasm just a tad as it is not indicative of a consumer who is necessarily engaged with your brand per se. And you also may want to not take out your dancing shoes just because you grew your Twitter followers by X%. The first two results alone from the chart above say it all and if not all, they say a lot. Consumers are creatures of habit, they are human beings which means they want something in return for their engaging with your brand. The need to engage with consumers extends well beyond the scope of social media. People want the personal touch, they want to know brands understand them and offer the ability to create a brand experience that matches their individual tastes. Yet that is apparently not happening as you will see another example of the major disconnect between consumers and brands. And since I am such a huge fan of infusing humor into, well just about everything in my life but especially advertising and marketing, I had to share this one final finding from the report which speaks directly to the power of humor to connect and engage. As a business owner, the time you spend working on your business is vitally important to your company’s success. Considering the enormous amount of time it takes to stay focused on current social media trends, you need a team of experts that you can count on to provide timely and accurate marketing techniques that produce results. We believe your time is better spent working on what you know best, your industry. Let us focus on the latest social media trends; contact us today for a free initial evaluation and consultation.